Moving can be both really exciting and really stressful, especially for a family. The trick to a smooth move is to organize a comprehensive moving plan well ahead of time and to execute that plan when the time comes. Organization, efficiency, and preparation will help you deal with all the challenges that moving to a new house may bring your way. 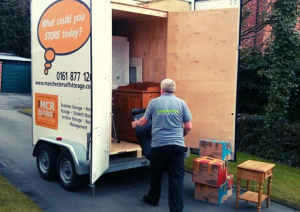 If you’d like to know how to move without losing your sanity and feel confident during the process, just follow this MOVING SCHEDULE compiled by MCR Self-Storage to help you move without surprises. Clean out your closets and cabinets and get together all the things you don’t need any more. You can have a sale – in your garage or online – and donate all that remains so that you are left with what you really want to keep. Moving requires costs people often don’t think about. Consider limiting these costs by getting boxes and supplies from MCR Self-Storage. You can also get a Mobile Self-Storage Unit when you store with us. Renting a storage unit is a smart choice whether you are staging your home to sell, in between places, downsizing, or just need to get items out of the house so it’s easier to pack. We provide excellent options. Pack boxes every day at a pace that is suitable for you to avoid rushing last minute. Start with the items you use the least, such as seasonal items. Make sure to label all sides of each box with which room it goes in. Call all your utility companies to inform them of your move and new address. Also inform your cable/internet company, bank, schools, car insurance, health insurance. Make sure you forward your address with the post office and advise them of the start date and duration. Also change your address with credit card companies and magazine subscriptions. If you are moving to a new area look for physicians, dentists, schools, banks, fitness centers, and other local services that you and your family regularly use. Check reviews and compare online to find the best service for your needs. This will make it easier to organize what you need to move, and when you need to move it. In the event of having to make an insurance claim, an inventory of your items will safeguard you as well. Pack shampoo, shaving cream, razors, soap, a toothbrush, toothpaste, towels, makeup, clean sheets, a change of clothes and anything else you will need for each person in your family and label the box clearly. Now that the majority of your house is packed, you can begin cleaning the hard to reach and often missed areas of your home. Deep clean your fridge and stove so it will only need to be wiped down before you leave. Do any needed repairs. If you hired a moving company, or anyone else to assist you – like MCR Self-Storage – call and confirm to make sure everything goes smoothly on moving day. There will be a lot going on on moving day and you will want things to go smoothly without worrying about your children or your pet. Make sure you have a plan in place, so someone is caring for them that day. The last thing you want to take with you to a new home is dirty laundry. It’s best to take care of it before you move, so that you don’t have any more work when you move into your new home. Clean the windows, wipe down the stove, make sure the yard is mowed if there is one, sweep, mop and make sure everything is in good order when it’s time to go. Don’t forget to make alternative food arrangements so that you can defrost the refrigerator, clean it and dry it before packing it. Compare the mover’s inventory with the one you made to make sure that there are no discrepancies. Make sure you are present when your things are being moved to ensure they are being moved carefully and completely. Do one last walk-through to check for anything that needs attention. Turn down the thermostat and the fridge. Make sure the windows and doors are locked and the house is secure. Don’t forget to wish your neighbours Goodbye! We hope that this Moving Schedule has been of use to you and we wish you A Happy Moving Experience!